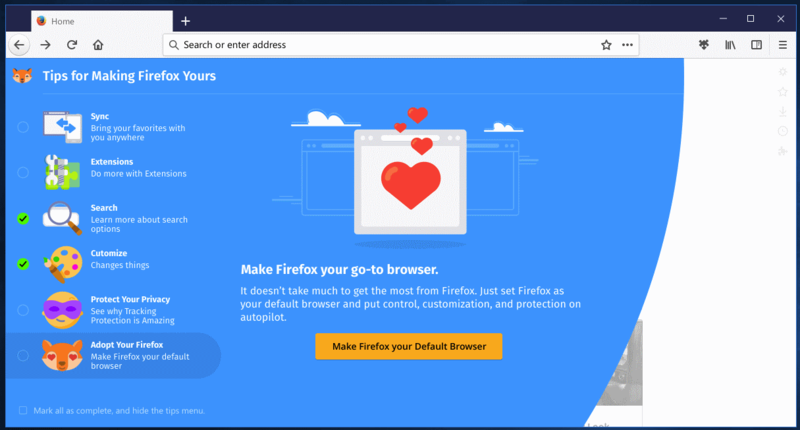 The first mockup shows Firefox running the Photon user interface, and the about:home page of the browser. The UI has not changed all that much when you compare it to last week's mockup. Tabs are still displayed in rectangular shape, and the address bar is still centered. Some icons look different, and some have been moved around if you compare their position to current stable versions of Firefox. The reload button has been moved to the left side of the address bar for instance. There is also a ... icon which is new, and some of the icons on the right have a new design but have identical functions. The about:home page shows several new features. There is a new Firefox icon in the top left corner that displays several tips when you click on it. The about:home page is the first page that opens after a new Firefox installation. 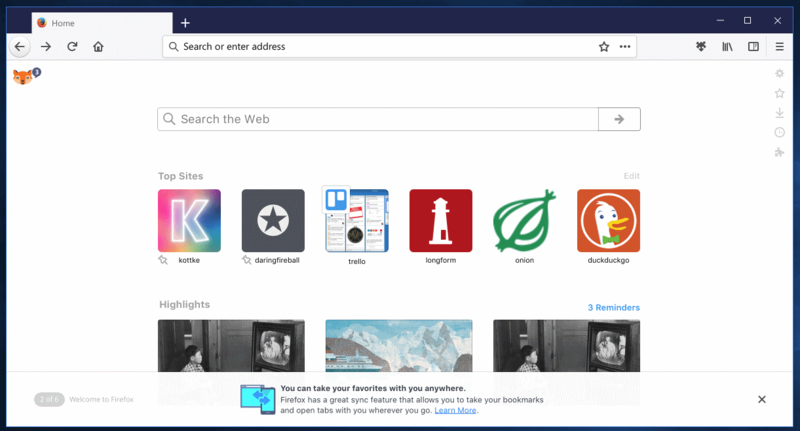 The new tips section, if it survives and becomes part of the final release, introduces core Firefox features to users of the browser (especially new users). Probably the biggest change in the new theme is related to tabs in the browser. 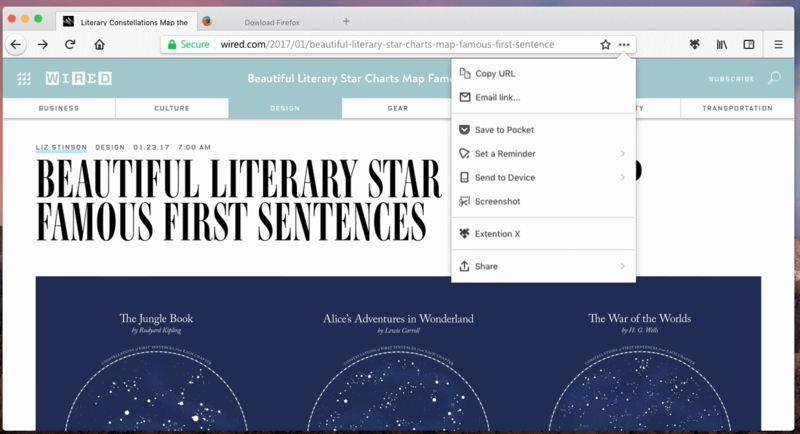 Mozilla launched curved tabs in Australis, and plans to make tabs squared in Firefox 57. These tabs are full squares, whereas pre-Australis tabs used had rounded edges. The mockup shows no search bar, and the address bar is centered on the main toolbar. While this could mean that Mozilla will hide the search bar by default, it is too early to conclude that or anything else related to the design. Another change that is visible on the mockup is that back, forward and reload buttons are visible on the left side of the main toolbar. they aren't going for a separate development branch, and most changes will land gradually as they are ready. The more noticeable ones might be behind prefs or build system trickery. You can't customize the menu anymore, but only put buttons on the toolbar or in the overflow menu? If you remove that empty space, then the only time you would be forced to use the overflow icon is when you have resized the window to be too tiny. So then exactly the same behavior you have in FF right now. Channelling your inner fanboy mighty ? Last edited by mightyglydd on April 6th, 2017, 4:33 pm, edited 1 time in total. Looks good. Love that they've restored the home and stop/reload buttons to the LHS of the location bar. Trillions of braincells have been drained to death to get the tabs nicely rounded, now they believe going back to the start is the way forward. Rumor has it that the spaces to the left and right of the Protonic Bar are reserved for mini-gifs of Mozfests.